Finkelstein Metals – Best quality production, on time door-to-door delivery! 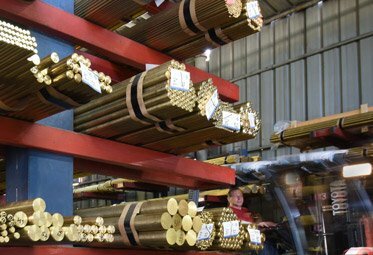 For decades, Finkelstein Metals has manufactured a wide variety of metal products including bronze, brass, aluminum bronze, green metals bars, shapes, rods, ingots and Billets, exported across the globe. 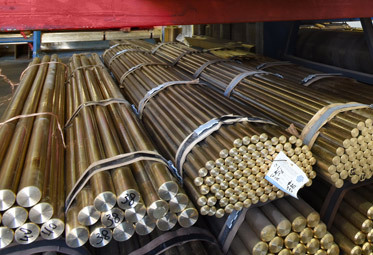 In addition to copper alloy bars, we supply ingots – ready to be re-melted; and billets – ready for extrusion. We offer special shapes in continuous casting or extrusion. Customers can purchase off-the-shelf products in small or large quantities from Finkelstein’s large inventory, or order specific shapes and measurements. We pack and ship our products world wide. Our products are delivered with a Certificate of Compliance (CoC) that states their chemical analysis, mechanical and physical properties. We control both, in order to be able to offer alloys with specific values, for example contamination levels, hardness, and so on. We are always happy to help our customers find the right solution, based on our vast experience and knowhow. Finkelstein – Meeting and exceeding customer requirements. This mode of operation can save the customer a lot of money. Customer pays only for the net weight of material in the final part and the machining labor. This is a service we offer in house and usually as part of the manufacturing process. We can cut and/or turn small diameter rods as well as very large diameters. We will cut pieces of just few millimeters or will sometime cast the bars initially to your required size. We can turn large diameter bars and billets to get you products with better surface and fit. Although you can find a very large range of bars sizes, and although we offer both metric and empire sizes, sometimes a specific size just in between is required. We can help. As a mill manufacturing non standard sizes is part our standard schedule. Send us your sizes and we will get back to you with an offer. You may find within our products portfolio a very large range of standard alloys, made to a range of international standards. And when and if standard is not working and a specific requirement is required: chemical composition or mechanical properties, let us help with the challenge. We will cast to the specification and control the outcomes at our well equipped laboratories and form a standard non standard product for you, one that you will be able to reorder and be sure you will gat the same properties each time. When just a regular shape like Solid or Hollow Round/Hex/Rectangle is not enough, usually for large volumes of machined parts with a specific shape, a closer to the final size and shape profile is needed, to save turning, processing time and energy. We have a lot of experience in casting and extruding special profile and we will be glade to help. Please consult us if you need special profile, Finkenstein metals Professions are available to assist. 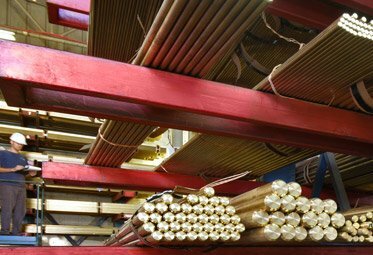 When a copper alloy bars are needed here and now (usually in small quantity too), the only way to have it is from a well stocked and managed warehouse. However Metal Bars very in alloys, shapes, sizes and length. Of each combination, a sufficient quantity mast be available in stock. This is very complex and (heavy) matrix to manage and take care of, and this is the service we offer our clients. We carry all those tens of thousands of bars in our warehouse waiting for you for the moment you’ll need it. Please let us know what you need and we will reply with at least one option to fulfill your request.